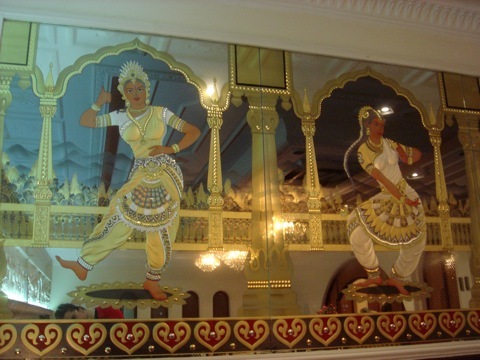 We used to go to this great indian fusion restaurant in Kuwait called Asha's. Since then, I have never been able to go to an Indian restaurant without comparing it to Asha's. I miss it. I'd go back to Kuwait just to eat there again. Asha Bhosle is a Bollywood legend, 1996 Grammy and 2002 BBC Lifetime Achievement winner, AND she also cooks great meals for friends and family. She also wrote and recorded over 13,000 songs, so say the write-ups on the LP-cover-shaped menu at her restaurants. Despite being inside a mall, Asha's in Kuwait has a great atmosphere. After all, it is Marina Mall, complete with yacht "parking" , and Asha's not only has pretty food and ambiance, it also has a sea view and a resident dj playing remixes of Asha's 13 thousand songs. And the food is dreamy. Here in Bahrain there's Lanterns,Nirvana,Clay Oven, Copper Chimney... plus dozens of other places unworthy of mention because the food there looks like reddish, oily mud and taste of too much ghee and turmeric. As my first contact with Indian food was at Asha's , I kind of have been expecting too much from any other Indian restaurant. Lanters is FUN. It's got its own sikh live band ( not zz top, sorry to disappoint you) and a half pick-up truck framing the bar. It's super kitsch, it's got that yellow glow of candlelight everywhere, and a saturday night promo of all you can eat for 5BD (15 dollars, i think). Food's good and plenty, so make sure you bring an appettite. They have this "Tid Bits Platter" and the snow fried mushrooms are deliciously fattening. The other night we had a late night meal at Copper Chimney, but neither Anis nor I knew how to order. I thought an Indian green curry was similar to a thai green curry and ended up with potatoes and cauliflowers drowned in spinach-ghee sauce. Anis ordered " chicken with that sauce that's not scary hot" and ended up with tomato ghee sauce. Our friend Sheyma knew how to order and got delicious vegetarian paneer dumplings in malay curry sauce.